Miliband said if Labour wins the general election in May, the party will lower tax breaks for pensioners earning over £150,000 to fund cuts to tuition fees. While some welcomed the move, others derided the pre-election promise for not addressing the wider issue of why the UK has tuition fees at all. The National Campaign Against Fees and Cuts (NCAFC) said Labour had not gone far enough. “Dropping fees by £3,000 is a token gesture,” she said. Redmond, who is a student at City and Islington College, said Labour’s proposed reduction would provide little benefit to those studying. “That's before we even touch on those who still won't be able to even go to university because it's still too expensive,” she said. Redmond said as long as university education comes with a price tag, it will always end up excluding somebody. “Labour are scared of the students vote going to the Greens, but are too shameless to even offer us something worth voting for,” she said. Reflecting on the unexpected policy announcement, the NCAFC said it was the result of years of student protests. 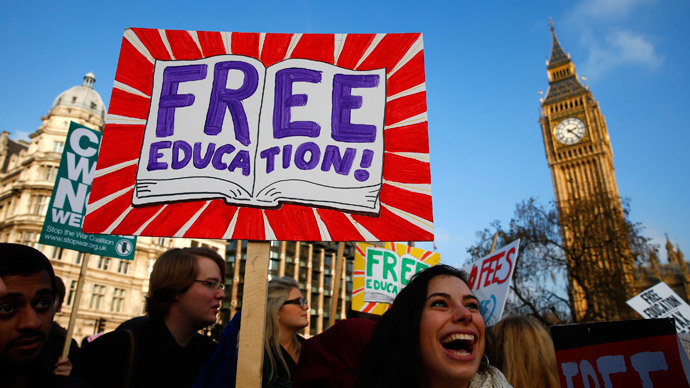 Demonstrations against tuition fee hikes and cuts to higher education funding attracted tens of thousands of people in 2010. On November 10 of that year, between 30,000 and 50,000 protesters marched through central London as part of a mass national walkout. Aggressive police tactics resulted in violent confrontations, with hundreds of students kettled in Trafalgar Square. Social media users echoed the NCAFC’s response to Labour’s tuition fees pledge. “@UKLabour A big lie. Before Labour tuition fees were zero. You brought in the £3,000 charge. The fees were your idea!” tweeted Thomas Lawlor. @UKLabour A big lie. Before Labour tuition fees were zero. You brought in the £3000 charge. The fees were your idea! Another Twitter user queried the high interest rates which are applied to student loans. “What puzzles me about tuition fees is not whether £6k or £9k but why are they charged commercial int rates when govt borrows so cheaply?” asked @Stressed_Eric72. What puzzles me about tuition fees is not whether £6k or £9k but why are they charged commercial int rates when govt borrows so cheaply? £6000 or£9000. Tuition fees still LOADS of money. Seriously Ed, if you can't fix it, don't bother just tinkering. Focus on what you can fix! @Arjmor expressed a sentiment held by many exasperated with Labour policies. “£6000 or £9000. Tuition fees still LOADS of money. Seriously Ed, if you can't fix it, don't bother just tinkering. Focus on what you can fix!” he tweeted.